^ Magnetic susceptibility of the elements and inorganic compounds Archived 2012-01-12 at the Wayback Machine., in Handbook of Chemistry and Physics 81st edition, CRC press. ^ Clark, David L.; Hobart, David E. (2000). "Reflections on the Legacy of a Legend: Glenn T. Seaborg, 1912–1999". 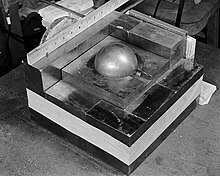 Los Alamos Science 26: 56–61, on 57. ^ Söderlind, P. (2001-8). “Ambient pressure phase diagram of plutonium: A unified theory for α-Pu and δ-Pu” (英語). EPL (Europhysics Letters) 55 (4): 525. doi:10.1209/epl/i2001-00447-3. ISSN 0295-5075. http://iopscience.iop.org/article/10.1209/epl/i2001-00447-3/meta. ^ Baker, Richard D.; Hecker, Siegfried S.; Harbur, Delbert R. (Winter–Spring 1983). “Plutonium: A Wartime Nightmare but a Metallurgist's Dream”. Los Alamos Science (Los Alamos National Laboratory): 148, 150–151. http://library.lanl.gov/cgi-bin/getfile?07-16.pdf. ^ Moody, Kenton James; Hutcheon, Ian D.; Grant, Patrick M. (2005-02-28). Nuclear forensic analysis. CRC Press. p. 168. ISBN 978-0-8493-1513-8. http://books.google.com/books?id=W3FnEOg8tS4C&pg=PA168. ^ Samuel, Glasstone; Leslie M., Redman (1972年6月). An Introduction to Nuclear Weapons. https://nige.files.wordpress.com/2009/10/glasstone-introduction-to-nuclear-weapons-72a.pdf. ^ National Academy of Sciences, Committee on International Security and Arms Control (1994). Management and Disposition of Excess Weapons Plutonium. ^ Crooks, William J. (2002). Nuclear Criticality Safety Engineering Training Module 10 - Criticality Safety in Material Processing Operations, Part 1. Retrieved on 2006-02-15.